Everyone knows that the official start to summer is when school is out, no matter what the calendar says! Well I am counting today as the beginning of summer. Although Darling Daughter was out last week, the monumental rain and lack of sun made is seem like anything but summer! So today is it!!! Ninety degrees has arrived, it is hot and dry. My to do list for the week includes flower beds, yard work and hopefully a little time to enjoy the hammock with a glass of sweet tea. 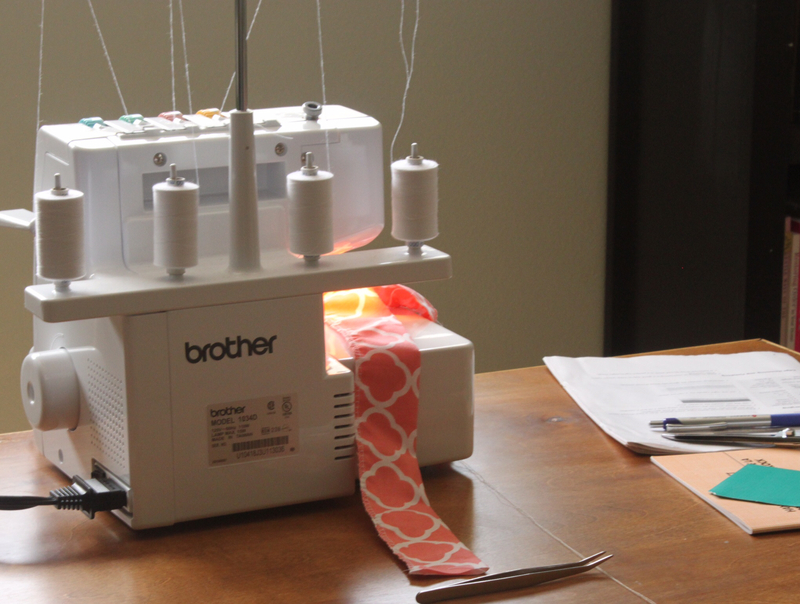 Hoping to get more comfortable with my serger this summer! I am also checking off many projects I have put off too long. I started adding some coral accents to my craft room a few months ago, I painted a few accessories and bought some fabric to make a pillow for my "comfy" chair. I was actually excited to tackle this project today, I don't sew often and I learned most everything I know from watching my mom who is an excellent seamstress. I must admit that it took me longer than it should have, but I finished and am pleased with the results. 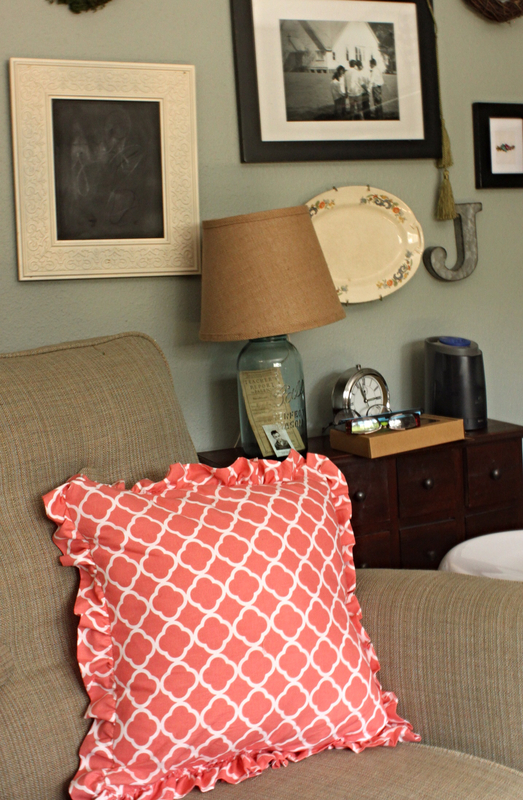 I am hoping to get the craftroom put together in the next few days and show you around, but until then here is the finished pillow in my chair! Summer ends when the curriculum does around here. Still wishing for it! Thanks for dropping in, hoping you are on the countdown to summer fun! 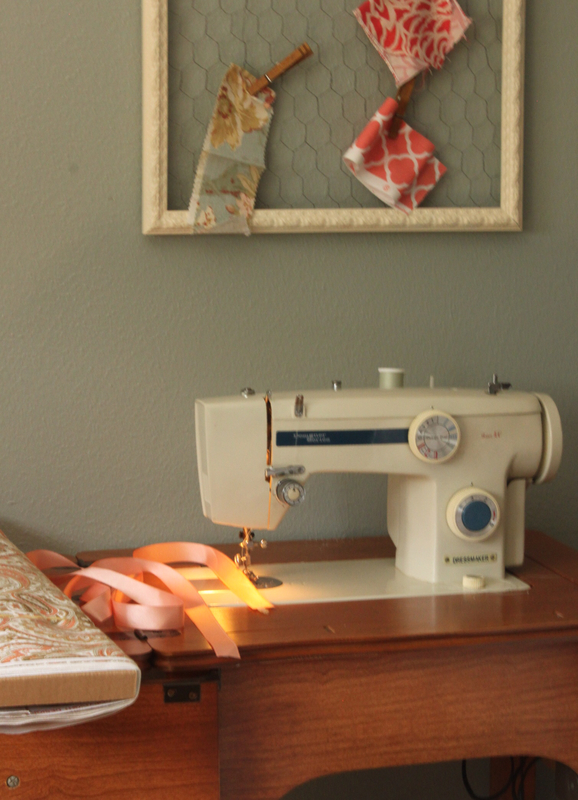 I can just catch glimpses of your sewing room and it looks like such an nice place to work. I am envious! Maria, I love this room! It is so nice to finally have my own place! I hope to sew more this summer!